Image kindly supplied by Regular Reader. This entry was posted in UKIP, X Election Police and Crime Commissioner and tagged Jack Clarkson, SY Police & Crime Commissioner, UKIP by Rik. Bookmark the permalink. (1)	“It took me 30 years to become an Inspector, which should indicate to you that I’m not one of life’s brightest. For goodness sake, you got to be a Superintendent after 30 years during this period just by turning up for duty.” and…..
(2)	“Of course, I am accusing everyone else of knowing what was going on in relation to child sexual abuse during my service as a policeman – except me, because I was so out of touch with local people and communities that I knew nothing at all” or “I was in touch with the local communities where I was a police officer, and I chose to ignore what was going on in relation to child sexual abuse.”? Whilst he is not a “career politician” he has represented both the LibDems and UKIP as a councillor. “Career” is both a verb and and a adjective. PC Jack Carlson careers between political parties. Allen Billings is a career politician????????????????????? “Canon Dr Alan Billings is a member of the Youth Justice Board and is a retired Anglican priest. Alan Billings is also the director of the Centre for Ethics and Religion at Lancaster University. He contributes regularly to the programme Thought for the Day on BBC Radio 4. Active in local government, Alan Billings was a member of the Home Office Community Cohesion Panel. He also serves as a schools adjudicator and is Chair of the Cumbria Courts Board. Alan Billings was educated at Emmanuel college, Cambridge University and subsequently trained to become a teacher while attending Bristol University. After time spent teaching in Leicester and Barnsley, Alan Billings trained to become a priest and following ordination he served at several churches including St Silas Leicester and St Marys in Sheffield. While in Sheffield he was Deputy Leader of Sheffield City Council and was a contemporary of David Blunkett. At this time in the late 1980s, Sheffield city council was engaged in infamous disputes with Margaret Thatcher. During this period Alan Billings gained a doctorate by carrying out research that ultimately contributed to the controversial anti Thatcherite report: Faith in the City. For a period, Alan Billings was the Principal of the West Midlands Ministerial Training Course, a part-time course for ordinands of the Church of England, the Methodist Church and the United Reformed Church, based at The Queen’s College, Birmingham. Latterly Alan Billings was the vicar of St Georges Kendal in Cumbria, England. In 2014. Rev. Dr Alan Billings was selected as the Labour candidate for the PCC by-election, to replace the disgraced former PCC and Rotherham councillor Shaun Wright. – It is prohibitively expensive to stand as an independent. As far as I can see neither of them are. Why do we need these pccs in Rotherham,the police cannot be trusted,Shawn Wright could not be trusted,and now we have another set of people from all political partys to take his place,can they be trusted,look at the canadiates ! I wonder if its anything to do with the £85k a year plus expenses,plus someone to help you on £40k a year plus expenses.For me its all a waste of taxpayers money,lets spend the money on finding the Packistani peodes that have abused so many KIDS for so long . You have to question UKIP’s selection panels mentality to choose an ex-South Yorkshire police officer who was serving through the period covered in the Jay report on CSE in Rotherham; his credibility is none existent. Then we have lose canon Billings who states he is not a politician, what was he doing whilst deputy leader of Sheffield council, communing with god. How can you trust a preacher who lies. I still believe the best thing to do is make this election for a none existing job none existing by not voting for any of them. I’ve looked again at Dr Billings’ leaflet and re-watched The Star husting – the sad things you do, when far away stuck in a hotel room – and have simply been unable to find your alleged ‘I am not a politician’ statement. Please provide exact quote and reference to support your assertion, or withdraw it. I think it is particularly offensive to accuse someone of lying when, as far as I can see, there is no evidence of that. What would I bring? Three things. Of course, in its ordinary meeting ‘I am not a politician’ is accurate. As far as I can tell, he hasn’t been a politician (someone elected or appointed to hold political office) for some 25 years. And, it appears that Dr Billings spent more time as a student than as a councillor…….. but we wouldn’t call him ‘a student’ now. None of those people look sound enough to sort out the corrupt SYP. You would need someone a lot stronger, competent & brighter to do that. What is the grift on the Tory? As with dave4dinnington above, I think you ought to justify your allegation or withdraw it. I’ve spoiled my vote and encourage everyone to spoil theirs. I sincerely hope we do not end up with either the Labour or UKIP candidate. I don’t want us to end up with the EDP or Tory candidate either, but I’d consider either of them to be the lesser of the four evils (such is the scale of evil). Perhaps Canon Billings can pray for the end of the world to save us from the misery to be enforced upon the people of South Yorkshire come 10pm tomorrow when the voting is over. •	Independence. I’m not a politician and have no previous involvement with South Yorkshire Police. As such I can hold the police to account – crucial if the Commissioner is to have credibility dealing with the findings of inquiries into past practice. Billings was a politician 20 years ago. Is it a case of ‘once a politician, always a politician’? I understand he has done a number of things since his time in politics, one of which was to sit on the Youth Justice Board. If he’s not a politician then he better start learning how to be one pretty damn quick. Otherwise the sharks will just chew him up and spit him out (If he wins). Politics is a rough old game where the weak get squashed. 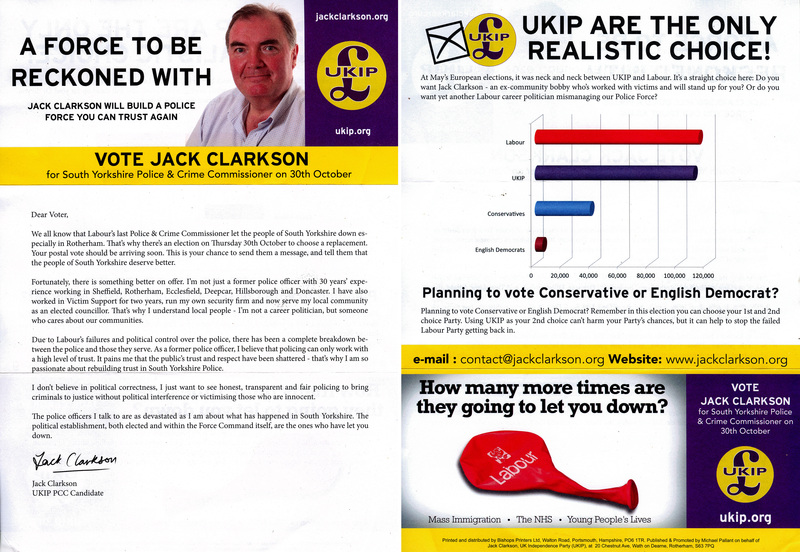 Mr Clarkson stood for the Liberals when they became popular in Sheffield and then left the Liberals when they started to become unelectable in S6; he then claimed to be an Independent – a poplar thing at the time with the closure of the local Sports and Health Centre in the area (although he regularly espoused privately his admiration of the Tories cuts) and then became UKIP when they started become more popular. He’s just a chancer really. Any horse for office. Now we can all change our views at times but not as conveniently as Mr Clarkson does. He’s the ultimate local career politician – and one who sadly tries to hide his real past in the SYP – as I highlighted on the UKIP poster thread. He may get in; but if he does the questions about his past will increase; whatever the result I think UKIP chose the wrong jockey and this choice will in the long run create problems for them. Voted for PCC at Sitwell Ward. The clerks are displaying national newspaper headline "No Immigration to Uk". Reported to RMBC electoral. If true – that is nasty . If it is true it may compromise that particular count and rightly so.